« Fall = Pumpkin Spice MADNESS in the USA! With distance – both in terms of time (16 years now!) and distance (5,019 miles/ 8077 km) – come inherent dampening. Younger people – gay or not – don’t viscerally know who Matthew Shepard is and the (unfortunate) role that he plays in Queer History. Germans my age might not know as much about him – although his impact was global, certainly the majority of the impact was within the boundaries of the United States. But remembering him and his pointless, untimely, death is something that I do. 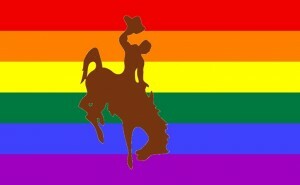 Today I’ll be wallowing a bit in things Wyoming and things about Matthew Shepard. Re-reading October Mourning: A Song for Matthew Shepard (a set of poetry), re-watching the HBO production of The Laramie Project, and – early in the morning – listening to a little bit of Cowboy football (the team is playing at Hawaii, and although the game is Saturday for them, for me, it is first thing Sunday morning.) There will be some brown and gold in my life, as well as some Jason Collins (Number 98!). For historical reference, see 2004, 2005, 2006, 2007, 2008, 2009, 2010, 2011, 2012, 2013, or any of the many times he’s been mentioned on my blog via a search for Matthew Shepard. I, too, refuse to try to forget the events of that day. There’s even mention of it in my latest book, which I hope will help to make and/or keep younger generations at least aware of it. We must remember the past, or we’ll be condemned to repeat it. Thanks for your comment — and your books look interesting. They’re on my to-buy list now — and actually, I’ve bought some already–now that I think about it.